The 6 Light Helaine Hanging Pendant Fixture features 6 powerful lights that can serve as workspace lighting, lighting for dining, entertaining, and especially pool play. Pool tables come in all shapes and sizes and with all different styles. Why dress up your pool table with all of the gaudy accessories, and then let your lighting fall flat? And, the same applies to dining tables, banquet tables, workspaces and elsewhere. Instead of letting your furniture be downgraded by your interior lighting, pledge to choose lighting fixtures that match or enhance your furniture. The Helaine 6 Light Pendant is ornate with its busy crystal style. The curtain of crystal prisms shoots light and color in every direction, and transitions into longer crystal droplets that give the lighting a hint of uniqueness. 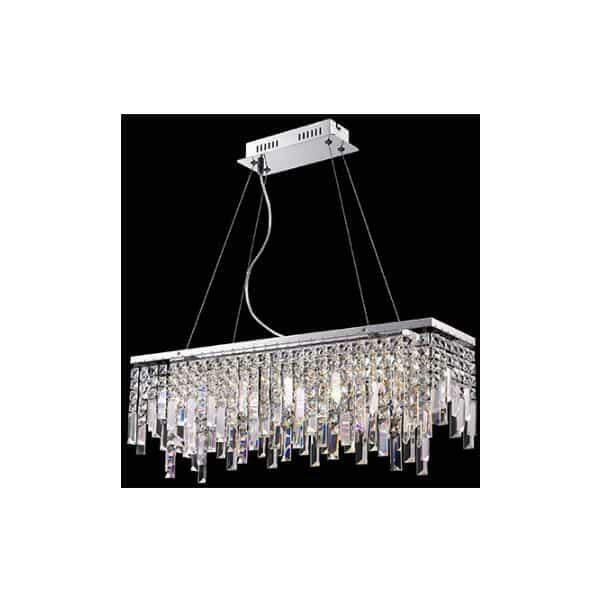 The Helaine line of lighting by Lite Source features beautiful crystal accents, powerful lighting and a chrome frame that brings it all into a crescendo of brightness and illumination.